The Migos made a stellar appearance at Paris Fashion Week to support their partner-in-crime Offset. The young rapper took over the runway last week sporting a white mink jacket designed by Virgil Abloh and a pair of oversized black and white trousers by Gunther Paris for Louis Vuitton. 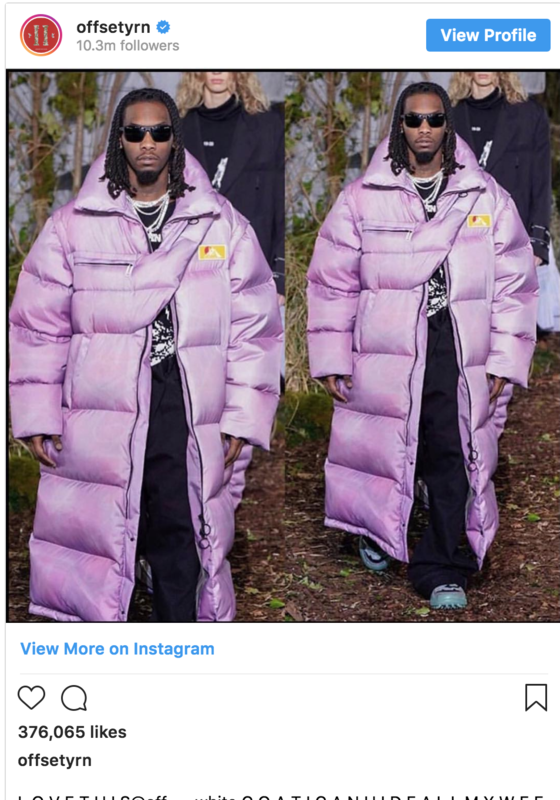 Fashion critics are calling him “The best-dressed Man at Paris Fashion Week.” Later, the Migos rapper was seen wearing an oversized lilac, floor-length puffer coat with a built-in cross-body bag, which he later posted on Instagram with the caption “Love this Off-White coat, I can hide all my weed in it.” It seems that Offset might be taking the lead on setting some high fashion trends this season, puffy coats, wide leg jeans and more! Fans are now questioning whether the entire Migos entourage will make an appearance in the modeling scene, — perhaps New York Fashion Week in February? Stay tuned!